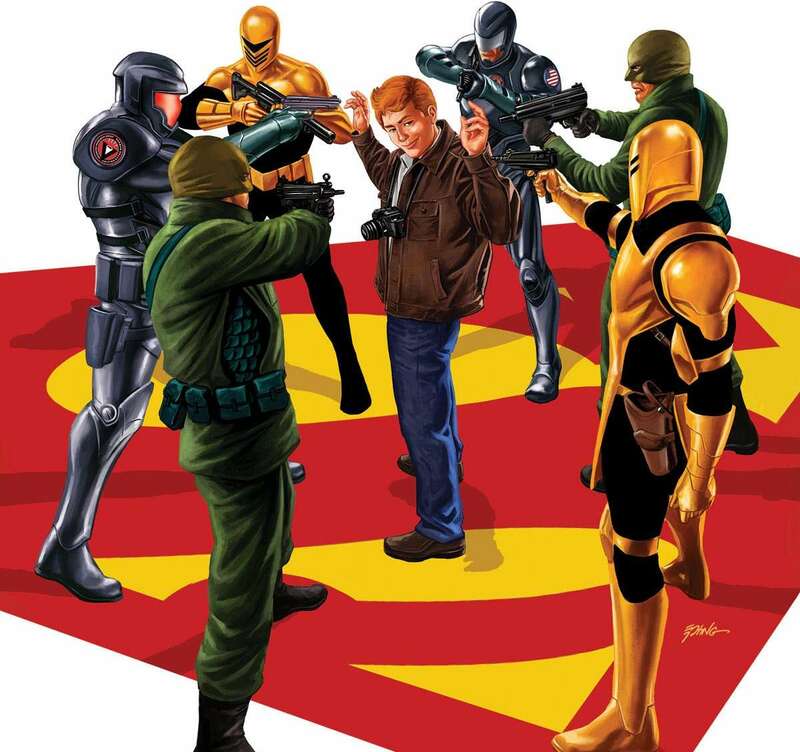 Action Comics #1008 review: The D.E.O. – AiPT! Amanda Waller. Director Bones. Sam Lane. The winds of change are here. Espionage organizations across the DC Universe are being hunted, with the same blue and white energy in the shape of a jelly-fish being the recurring piece that connects the larger puzzle. Kobra’s out. So is A.R.G.U.S. And now the next target? The D.E.O. The issue is set up by a splash page, as has become standard for this new run, with details and full references to things in the books and even beyond the books. As seen above, with references to other DC comics writers and listings of the multiple Crises and the various espionage agencies and their operators, it’s a neat bit of context to open the story. Kicking off with the arrival of Adam Strange at the D.E.O. base, the book re-introduces the organization run by the infamous skull-man, Director Bones. Chomping cigars and boasting a suit, the man is a cunning figure at the heart of the DC espionage world. Having a history of working with cosmic heroes, Bones has plans for Adam, but it all goes wrong when a mysterious behemoth with a silhouette akin to Marvel’s The Destroyer appears out of nowhere. In the blink of an eye, said being unleashes a way of Kirby Krackle in the rough shape of a jelly-fish, decimating the entire D.E.O. base. Strange manages to save Bones and a few others, but in the face of the blue and white crackling power, nothing may persist and death is absolute. Following the inciting incident in the issue, the book cuts to two characters for the most part and explores them until the conclusion. The two are very much whom the issue revolves around as the mystery continues to develop, connecting them all far more than imaginable. The first is Lois Lane, who finally makes her big return to The Daily Planet. Last issue, she revealed the true nature of her marriage to her father, Sam Lane and now she’s decided to take her job back. Bendis and Epting carefully play out this return, letting a double-page spread emphasize the importance of Lois’ arrival. Visual storytelling does the rest of the job, as it should, with silent panels full of expressions and body language tell a story on their own. Epting is very much a master of the double-page spread, using it with great purpose to draw attention to key moments while laying out the page such that there’s enough information in there to warrant its usage. Bendis’s voice for the characters, brought to life by long-time collaborator Reed, is also earnest and fitting. His Lois is anxious but manages to be confident, she’s burdened but puts then needs of others before her own. She feels like a complex individual and Bendis’ naturalistic dialogue helps make that possible. Reed, who’s consistently been killing it, letters the book with grace, cranking out eerie typeface that evokes horror for the title ‘Leviathan Rising’ and ensuring every SFX plays into aid Epting’s storytelling and Bendis’ intent, rather than detract in any way possible. The other key figure of the issue is Sam Lane, as he’s still very much trying to reconcile the revelations from the past issue. A member of A.R.G.U.S, he meets with Amanda Waller in a secret base, conversing with the old ally and confidant. Drinking, he confesses to her that he may just have been doing this all wrong. Laying out a double page spread of pure conversation, the team nails the emotional beats, making the character feel sincere in his regret and pain. Epting is a master of spy fiction, as any who’ve read work from his vast oeuvre can attest, and he puts those chops to use here. Anderson is an absolutely perfect collaborator for the artist, as he manages to set the scene for any context thrown at him. Whether it be cosmic heroes and Kirby Krackle with bright reds and blues or whether it’s more muted spy storytelling you’d expect from a James Bond comic, steeped in grays, dark blues and blacks, he makes it all work. There’s a great sense of cohesion that Anderson brings to the entire work and the ease with which he does it is admirable. Steeping the book in darkness and shadows, with clever usage of blacks, Epting and Anderson build a clear sense of mood and a distinct atmosphere that visually communicates and expresses the sense of intrigue and mystery at the heart of the story. The characters are very much in the dark and in the darkness, something stirs with blinding light. That’s the terrifying threat of Leviathan. Action Comics continues to be a suspenseful thriller with a lot of genuine character moments and fun DC Universe pieces, teasing an intriguing puzzle. With the Lanes at the heart of this issue, Bendis, Epting, Anderson and Reed deliver another solid installment of the new spy saga. Something is coming for the DC Universe and the slow build of tension, with characters we love at the heart of the struggle, grants the already fun concept a bearing it would otherwise lack. There’s a genuine sense of excitement with Bendis’ work at DC and there’s hardly a better example than this issue. Who would have ever imagined we’d see Adam Strange pop up in an espionage epic in Action Comics? The creative team continues to surprise and entertain, delivering what we never knew we wanted. The inspired and earnest character moments and the general characterization, which is both nuanced and classic. Epting's visual storytelling prowess, which showcases its great range, from settings and layouts to the emotionality and character he's able to get across.